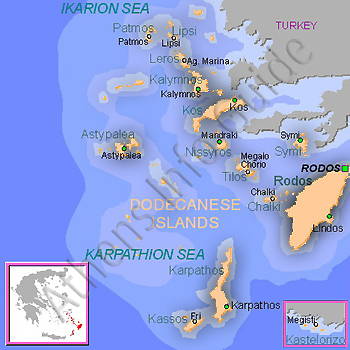 The modern prefecture of the Dodecanese consists of 163 islands in total, of which 26 are inhabited. Twelve of these are major, giving the chain its name. The most historically important and well-known is Rhodes (Rodos). Of the others, Kos and Patmos are historically more important; the remaining nine are Astipalea, Kalimnos, Karpathos, Kasos, Leros, Nisyros, Symi, Tilos and Kastelorizo.